Here at OIC of AAC we believe in the capacity of all individuals to grow and become self-reliant, if provided job skills, life skills, and proper motivation. Our instructors, and tutors all aim to help you achieve your goals. We hope to see you all soon! Mr. Johnson is currently teaching OIC's math and science class. Last year, Mr. Johnson assisted the math class as tutor. He was a favorite of the students. Mr. Johnson is currently a manager at Johns Hopkins hospital. He is a former student of OIC's executive director, Ed Greene. 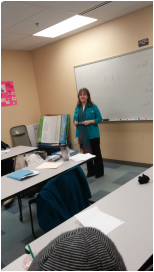 Mrs. Judith Hoover has been teaching Math, Science, Language Arts, and Social Studies for OIC’s GED program since December 2012. This fall she will be taking a break from teaching to study the Russian language. Mrs. Hoover has a BS degree in Math and a MA degree in Adult Education. She loves to teach and strives to create a friendly, hands on learning environment. Afraid of math? Have a hard time understanding it? Mrs. Hoover’s class is the place for you! Mr. and Mrs. Bullock joined the OIC team in 2015 when their nonprofit, Bless in Tech Ministries partnered with us. Both Mr. and Mrs. Bullock are skilled in computer use, and have made it their mission share their good fortune by training others. OIC recently added new instructors. Welcome Erin Snell, Grace Matthews, Lisa Walker, and OIC Alumna Roxanne McGowan.